Learning By Doing restored 0.9 miles of a distressed section of the Fraser River in Grand County to benefit aquatic habitat. On May 16, 2018, the collaborative group of water stakeholders that form Learning By Doing opened 0.41 miles of the restored river for public fishing . The Fraser Flats River Habitat Project represents a new era of water cooperation among East Slope water providers and West Slope agencies and conservation groups. 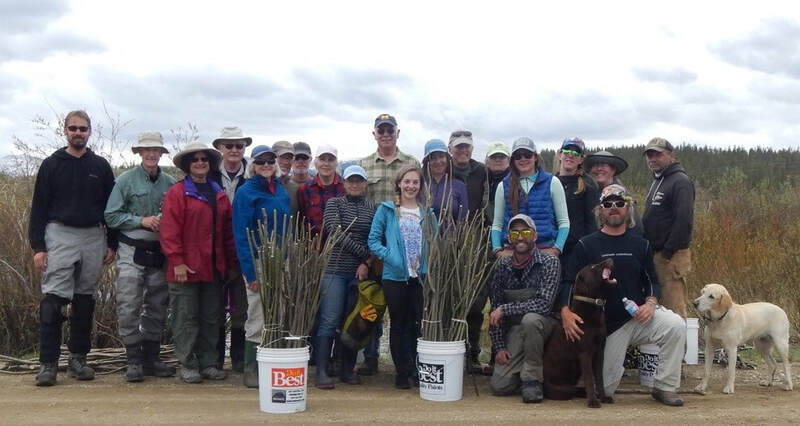 A crew of volunteers harvested willow stakes on May 19th, and more volunteers planted them on a 1-mile section of Ranch Creek on June 2-3, to help shade and stabilize the creek banks. Ranch Creek is on the state’s 303d impaired rivers list for temperature. This 2018 project was a partnership between LBD and the Colorado River Headwaters Chapter of Trout Unlimited, and funded by a Patagonia Enviro. Thanks to all! Be sure to fill out the Colorado Parks & Wildlife survey if you fish along the Fraser Flats public section. It will help us to better manage the fishery. LBD partners helped with Colorado Parks & Wildlife's annual project to measure the fish population, species, and growth rates in various locations along the river. Learning by Doing: The Perfect Storm on the Upper Colorado from HaveyPro Cinema on Vimeo. Grand County Learning By Doing is a cooperative effort composed of representatives from organizations across Colorado. We engage in a cooperative process to manage aquatic resources by protecting, and where possible, restoring and enhancing aquatic environments. Each organization involved in Grand County Learning By Doing contributes ongoing resources to benefit the county's aquatic resources.